Join us in a fun night as we welcome the 2019 Board of Officers, Directors, and Trustees. We'll have dinner, live entertainment, silent auction, and dancing. 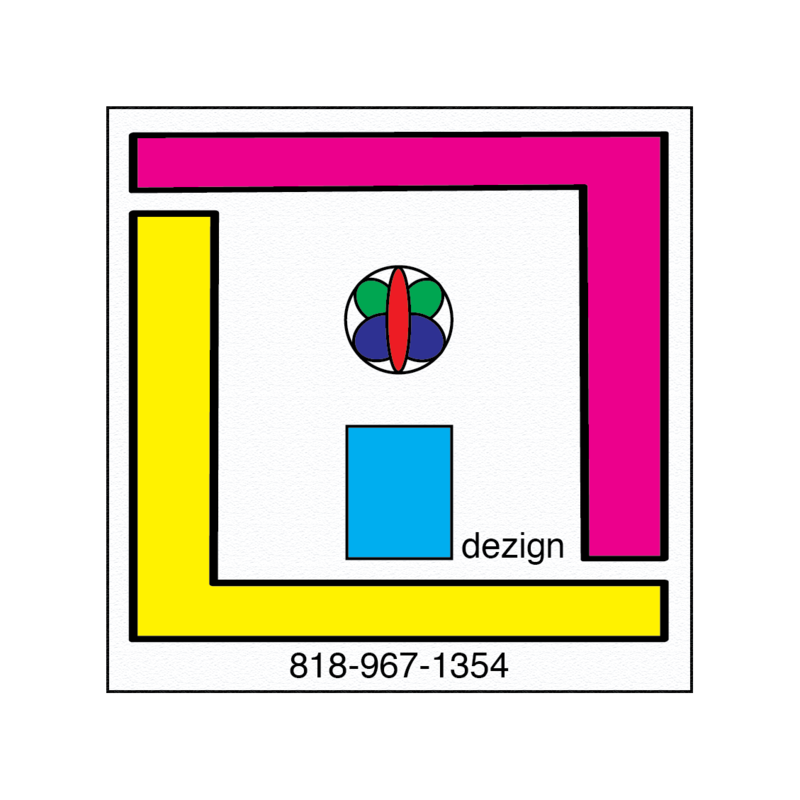 Proceeds from the event will help fund our 2019 projects, including scholarships and various outreach activities. Tickets are discounted at $50 each until January 31, 2019. From February 1-24, tickets are $60 each. 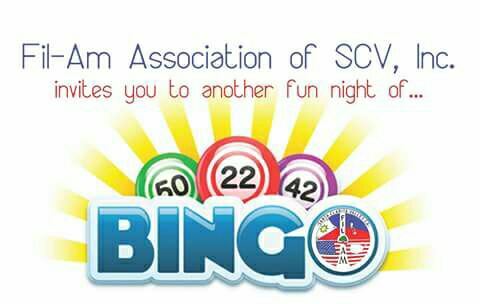 ‍Fil-Am Association of Scv, Inc.Bingo Night! $12 ticket includes admission, a Bingo packet good for all ten (10) games, and an option to purchase additional packets for $10 each, and may include an entry for raffle prizes. Coverall jackpot is $300 in gift cards. The amount of the prize for the other nine games will be determined by the amount of donations received, but will be at least $30 in gift cards. First game starts at 6:30 pm, doors open at 5:30 pm. For more information, to purchase tickets, to donate gift card prizes, or to advertise* during the event, please contact:Joel Javan- 661-607-1577,Emie Carrillo- 661.877.2699,Jelmar Pasco- 661.733.8713, orJoyce Maglalang- 661-607-5665. *Ads will be looped on a big screen TV in the main hall for the duration of the event. 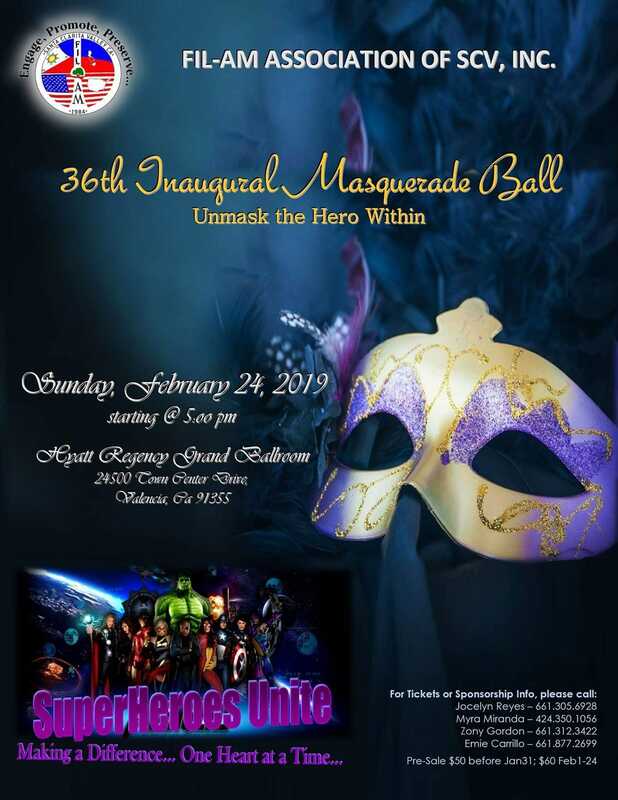 Proceeds go towards supporting Fil-Am Association of SCV’s programs and events such as scholarships, cultural awareness, civic programs, community involvement, and many others.